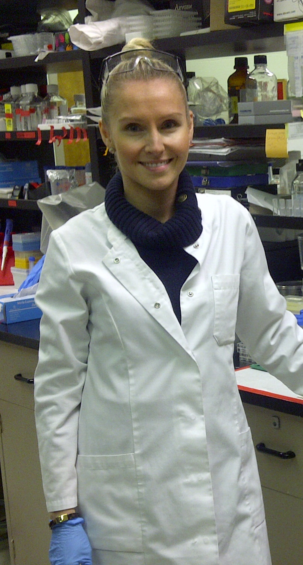 Elizabeth Fidalgo da Silva, Ph.D.
My research focuses on the study of the tumour suppressor protein “Tuberin”. This protein is involved in multiple cell pathways controlling cell growth and cell proliferation. Previously we have shown that Tuberin acts as a checkpoint protein in the G2/M phase of the cell cycle. Tuberin binds to the mitotic Cyclin B1 and regulates the mitotic onset. At the moment I am studying how the Tuberin-Cyclin B1 interaction is regulated. My preliminary studies demonstrate that this interaction is nutrient dependent and possible a checkpoint aimed to control the cell growth through the cell cycle. I am interested as well in studying the role of Tuberin in brain development and brain stem cell differentiation. I hold a Seed4Hope grant for the project “The Role of Tuberin in the Development and Progress ion of Pediatric Brain Tumors”. This project will determine whether Tuberin plays a key role in brain development and neural fate decisions. This work will help resolve important prognostic indicators, and future therapeutic targets, for Medulloblastomas and others types of cancers. I graduated from the Pharmacy program at the Karol Marcinkowski University of Medical Sciences in Poznan, Poland with M.Sc. in Pharmaceutical Biochemistry in 2006. I came to Canada and started my Ph.D. program in 2007 here at the University of Windsor in Dr. Porter’s lab where I took on a project studying the role of Spy1 in neurogenesis and glioma biology. I graduated in May, 2013. I published my work in Cancer Cell in January 2014. I stayed on to work as a Research Associate. My research right now focuses on Spy1, stem cell biology within the central nervous system during development, brain tumourigenesis and neurological malignancies. I began my Ph.D. in Dr. Porter’s lab in 2009 studying the role of Spy1 in normal and abnormal development of the mammary gland. I completed my degree in December 2014, and have stayed on as a research associate in the lab. Our research in the breast program is focused on elucidating the role Spy1 plays in regulating normal development of the mammary gland as well as how aberrant expression of Spy1 can contribute to tumourigenesis. A key focus of my work is on the development and characterization of new in vivo model systems to use as tools within the lab for all of our systems of study. 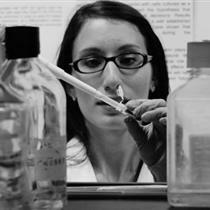 I began my Ph.D in Dr. Porter’s lab in 2009 studying the role of Spy1 in treatment resistance in breast cancer. I completed my degree in August 2015, and continued in the lab as a research associate. 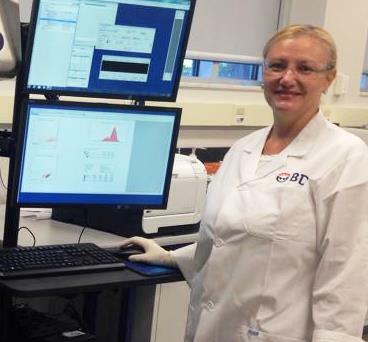 My research focuses on Spy1 and its signalling pathways within breast cancer and how they contribute to chemotherapy or hormone therapy resistance. My research has led to a publication in Oncotarget in 2017 where we showed high levels of Spy1 promotes resistance to the hormone therapy tamoxifen. Another aspect of my research focuses on using an in vivo zebrafish model system. Using this system, I can inject Spy1 manipulated breast cancer cells into the fish and can study the efficacy of chemotherapies on the survival of those cancer cells.